Heat oil in a pan and splutter mustard ,red chilly and urad dhal. Then add coconut and just fry it. Add raddish,onion,green chilly and curry leaves.Add salt and mix well.Close the lid for 5 minutes.Raddish will cook soon.so no need to keep this fire for long time. Simple raddish thoran is ready..serve with rice..
My reaction when i first saw the recipe - How can some one even think of making thoran with Radish??! With little bit of skeptisim i tried it and it turned out to be very tasty!! Frankly speaking, I was a little reluctant to try this recipe out as I have never included radish in Indian cooking before. But trust me girls , it's very very good. 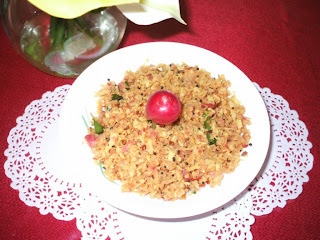 My whole family loved it...Thanks for posting the recipe Chithra. hi vinitha and reena ,thanks a bunch!! !